Conventional lasers have a small angular difference between the laser beam and the mechanical axis (boresight error). The MicroBlock allows this error to be manually adjusted to zero, by turning two small grub screws located on the side of the housing. It can also compensate for small mounting errors in the user equipment. The output wavelengths are available in 650nm or more visually intense 635nm where improved visibility is required. The output power of both models conforms to either Class 2 or Class 3R laser safety standards. The self-contained assembly will operate from battery or low voltage supplies, and uses minimal current. 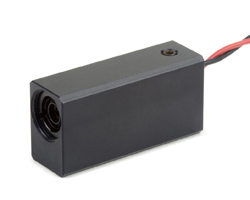 The housing contains the laser diode, driver, optics and boresight adjustment.